I was just organizing my finances for tax time (doesn't that sound important?) and figure this is a good time for an update on Way2Save. Interest is paltry but I'm way ahead of plan on this. My original post assumed I'd make $24 from billpay all year. As you can see that was covered in almost the first month! According to their calculator my year end bonus (assuming I didn't use my debit card or on-line billpay again) would be $100 in the first year. I have much to learn, master. I mean, I always thought that I was frugal, but I was such a fool! ROFL! 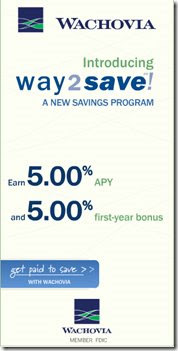 Are you a Wachovia customer?